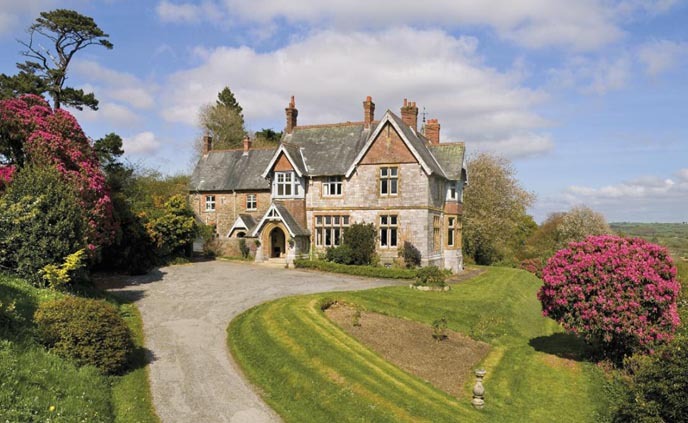 Cleeve Estate ~ Ivybridge, Devon. 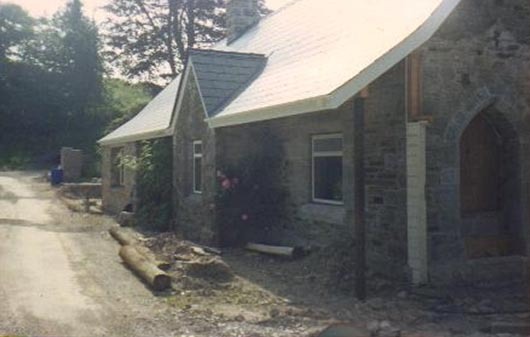 Cleeve House on the Cleeve Estate is situated on the outskirts of Ivybridge in Devon and was built in 1886 by the Sparrow family who were limestone merchants and owned quarries at Cattedown and Oreston in Plymouth. 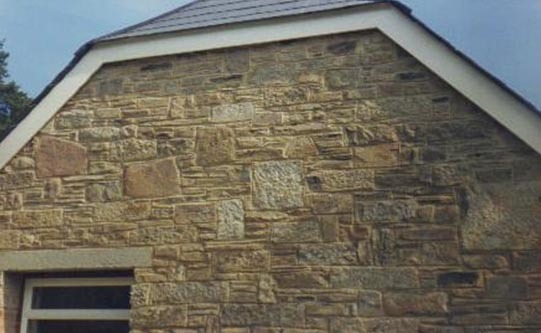 The most notable of these quarries being the ‘Bedford Quarry’ which later became known as the ‘Breakwater Quarry’ as it supplied all the 4,5000,000 tons of limestone blocks required to construct the breakwater in Plymouth Sound during the 1840’s. 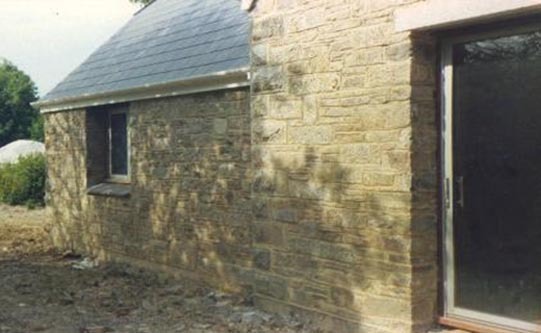 Countless buildings in Plymouth were also built with stone from this quarry. 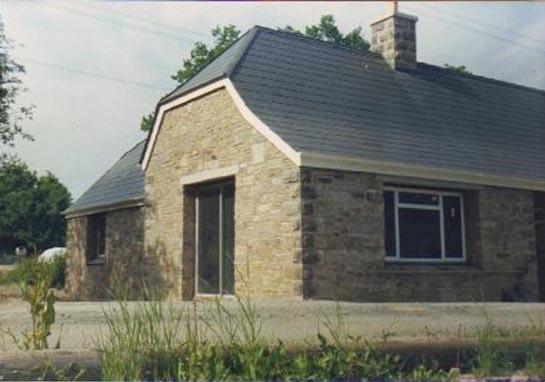 Leading into the estate is the old gatehouse and we carried out all the stonework to a ‘Hipped-roof’ extension which tripled the size of the existing footprint of the building, and then converted for residential use. 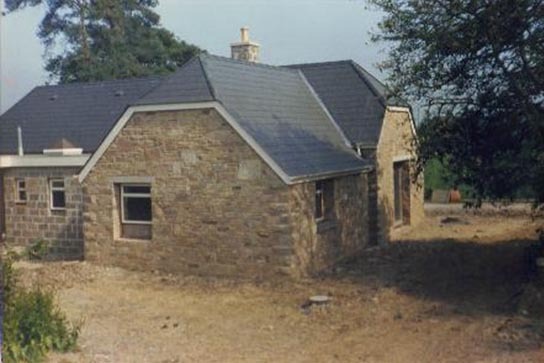 The gatehouse was constructed in random coursed limestone with dressed ashlar quoin stones which originally came from the quarries owned by the family. 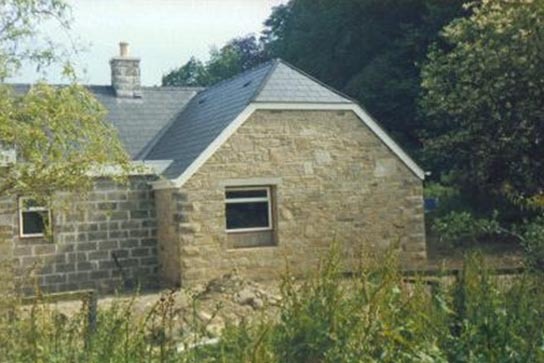 The random coursed limestone we used for the new extension came from a demolished nearby boundary wall which was a perfect match to that of the existing gatehouse. 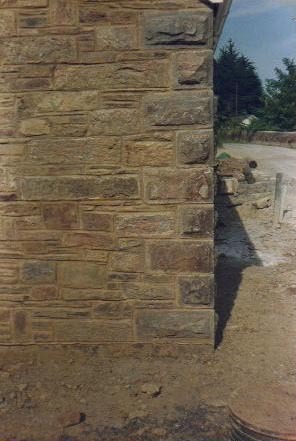 Two gate piers were also demolished which supplied us with enough dressed ashlar quoin stones for all the elevations. 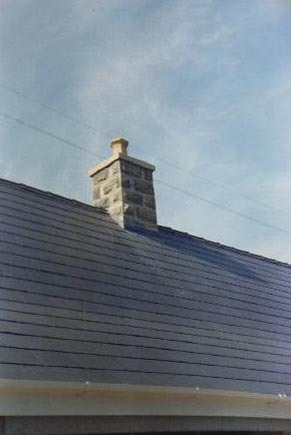 Ashlar stone is described according to its surface finish.The finish on these ashlar quoin stones are what is known in the trade as ‘Rock-faced’ ashlar in which the seen surface of the stone is left in its natural state, with little or no assistance from any chisel or pitching tool within the neat chiselled margins around the edges. 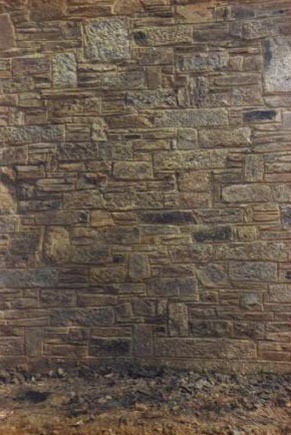 ‘Rock-faced’ ashlar must not be confused with ‘Rusticated’ ashlar as this is a completely different term altogether where the joint of each stone is set well back from the surface to give the joint a recessed appearance and determines the shape of the stone and not the finish, although the finish of the stone could still be ‘Rock-faced’. 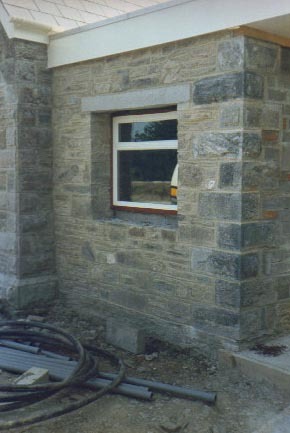 Traditional lime mortar was used to bed the stones. 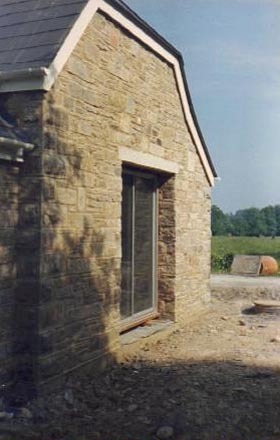 Slate sills and granite lintels were used for the window and door openings. 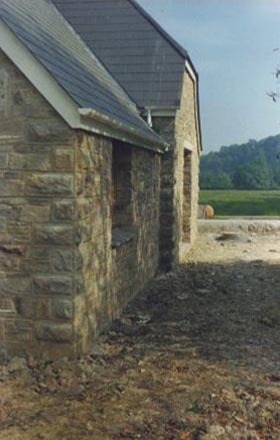 The stones for the chimney were cut and dressed on site to match the quoin stones we used on the rest of the building and these came from the plinths which formed the bases of the two demolished gate piers.